Just a short drive from Qualicum Beach and nestled amongst the tall trees of “Lighthouse Country” is the quiet executive community of “Nile Landing”, an upscale enclave of fine newer homes. Here you'll find this private and cozy 2122 sqft 3 Bed+Den/Office Rancher featuring oversized windows perfectly capturing the beauty of the setting, modern finishing with classic shiplap adding notes of texture and rusticity throughout the home, an oversized Triple Car Garage with a drive-thru bay, and an idyllic location on a landscaped .53 acre lot backing onto the protected forestland above Nile Creek. A covered sitting porch invites you to spend a moment enjoying the peacefulness and tranquility that surrounds you, while a front door with a transom and sidelight welcomes you into an overheight foyer with wide-plank oiled oak flooring that flows into a distinctive open plan Kitchen/Living Room featuring an overheight shiplap cathedral ceiling and built-in cabinetry book-ending a contemporary horizontal fireplace (propane)...ready to provide heat and comfort at the touch of a button on those cooler eves! The stunning Chefs Kitchen boasts instant hot water, durable quartz countertops, lots of stacked shaker-style cabinetry including a lighted upper level with glass doors, an island with undermount double sinks and a breakfast bar, a prep sink, crisp white tile work, and quality “Bosch” and “Fisher & Paykel” stainless steel appliances including a built-in wall oven and microwave/convection Speed Oven, an induction cooktop, a handy beverage cooler, and a double- drawer dishwasher. Oversized windows invite delightful forest views to your meals in the Dining Room with its modern pendant lighting and dual shiplap feature walls, but you're sure to take the french door out to a huge partly-covered entertainers patio for dinner al fresco accompanied by the music of birdsong echoing though the rainforest and fresh breezes carrying the relaxing aroma of the evergreens! You'll love the considerable and captivating outdoor space offered here; kids, grandkids, and 4-legged family members will find lots of room to run and play in the sunny south exposure of the huge park-like yard with its full fencing, delightful gardens, cute garden shed, and a charming rear gate inviting you to take a stroll through the rustic forest. Off the foyer you'll find french double doors opening to an Office/Den with a shiplap wall and crown molding, as well as a hallway hosting two good-sized Bedrooms and a 4 pc Main Bath featuring a custom quartz-topped vanity and vessel sink. In addition there's a custom Laundry Room with a stainless sink, cupboards, and countertop space that can also be accessed from the walk-in closet of the sizable Master Suite boasting a handsome trayed ceiling, California shutters, lovely forest view windows plus a clerestory for added brightness, and a superb 5 pc spa ensuite boasting a huge custom steam shower, a freestanding soaker tub, dual his/her quartz vanities with vessel sinks, and a french door opening to a private and covered Master's Patio with a fabulous hot tub inviting you to soak away the cares of the day! Among the many extra features you'll find an economical heat pump/HRV system keeping you warm in the wintertime and cool in the summer months, dimmers on many light switches, and a fabulous 1095 sqft Triple Car Garage with a drive-thru bay to an extra parking area and lots of room for a workshop if desired! The choice location offers country privacy and tranquility yet you're just minutes from Qualicum Beach and the quaint hamlets of Bowser and Deep Bay for shopping, amenities and a marina, plus it's an easy drive to Nanaimo and the Comox Valley! A stylish and captivating home in one of the most naturally beautiful areas on Vancouver Island….what more could you ask for? 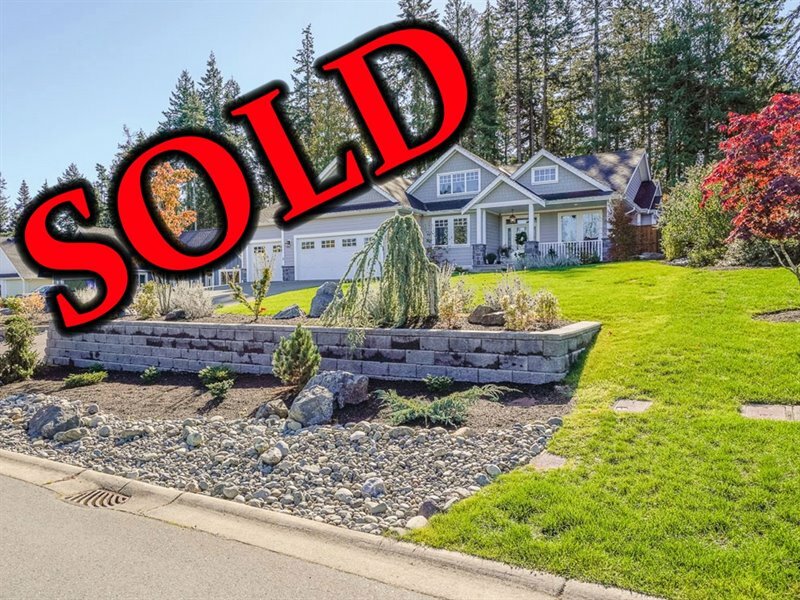 For more information on this Beautiful Qualicum North Home and for all your real estate needs in Qualicum Beach, Parksville, and Nanoose Bay BC call Team Susan Forrest, Royal LePage Parksville Qualicum Beach Realty.